Four JSGS students are getting ready to compete against teams from 13 policy and public administration schools across Canada. Libbey Morin, Lori Wareham, Michael Horvath, and Jared Dunitz will compete in the national case competition for policy and public administration students in three weeks’ time. Coaching the team will be Senior Policy Fellow, Dale Eisler, and Executive-in-Residence, Jennifer Ehrmantraut. To earn their place, the four students competed in the JSGS Internal Case Competition and were selected for the national team based on their proficiency and professionalism during this event. Jared is looking forward to the experience and to competing with policy students from across Canada. He is making sure to take the time to practice with his team to ensure they are ready for what is to come. Students will gather in Vancouver at Simon Fraser University’s School of Public Policy on February 23 and 24 for the 7th annual National Public Administration Case Competition (NPACC). NPACC is a joint project of the Canadian Association of Programs in Public Administration (CAPPA) and the Institute of Public Administration of Canada (IPAC). Sponsoring this year’s competition is Manulife Financial, Ernst & Young, and the Institute for Research on Public Policy (IRPP). The national competition was first initiated by JSGS in collaboration with IPAC. 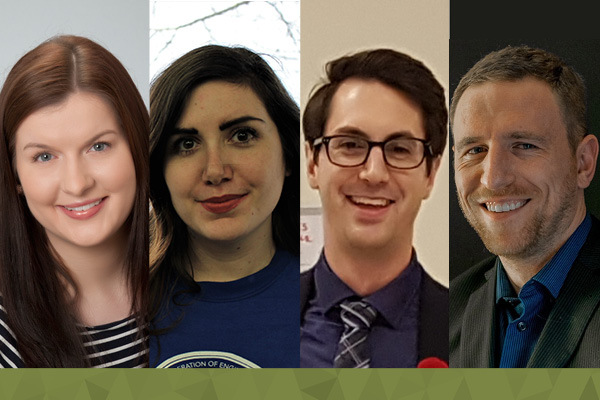 NPACC is designed to foster student learning, collaboration and professional development, build connections and contacts within the policy community, and to showcase Canadian policy students. In the seven days leading up to the competition, teams will prepare their analysis and recommendations on a case, the topic of which is kept secret until February 15th. They will present their work to a panel of judges comprised of five members from senior levels of the private sector and federal and provincial public servants. The judges will evaluate each team’s presentation and Q+A session, select the top three teams, and announce the winners at the Awards Reception. Following the announcement, each team will have the opportunity to meet privately with the judges to receive feedback on their presentation. "The Case Competition is a chance for students to work on a policy issue under pressure, much like they will in their future employment roles. It also allows students to work on their presentation skills. The students going to the national competition will be able to further these skills and learn what it means to come together as a team." The top three teams are awarded cash prizes, funded by the IRPP. The top ranked team will prepare a written summary of their award winning work to have it published in the IRPP Policy Options journal and on their website. Student Experience Officer at JSGS, Tianna Yaskow, recognizes what a great opportunity this is for all policy and public administration students to participate in. "The Case Competition is a chance for students to work on a policy issue under pressure, much like they will in their future employment roles. It also allows students to work on their presentation skills. The students going to the national competition will be able to further these skills and learn what it means to come together as a team." says Tianna. MPA alumnus, Paul Thompson, was part of the competing team in last year’s national competition at Ryerson University in Toronto as well as the competition in 2015 at Dalhousie University in Halifax. The most recent cases focused on F-35 fighter jet procurement issues and national infrastructure planning. Having competed twice at a national level, Paul was able to reflect on his experiences and offer some useful insight for this year’s team. The 13 competing Canadian schools include University of British Columbia, Carleton University, Concordia University, Dalhousie University, Glendon College, Johnson Shoyama Graduate School of Public Policy, Laval University, University of Ottawa, Queen’s University, Ryerson University, Simon Fraser University, University of Toronto, and York University. To show your support for our students during the competition, feel free to send them well wishes on social media, using the hashtags #teamJSGS and #peopleofJSGS, and tagging @SFU, @CAPPA_ACPAP, @IPAC_IAPC and @JSGSPP.